A couple of weeks ago, I was getting all ready to take care of my NEW BABY (swimming pool) complete with ensuring the proper water chlorination, pH level, learning to ‘Backwash’, Acid Demand etc. when my husband did something very odd. (‘agreeing’ to the pool was certainly odd so maybe he's on a 'doing odd things' streak). It was odd in that he never buys anything on impulse. No shoes, handbags, makeup (hard to believe if you’re a girl) even X Box games are researched for days, weeks, sometimes months and then purchased only at half price shops/internet. He also only obtains the exact amount of items at the grocery store (assuming he can find them). So, it was very peculiar when he and Alec went to the movies (1/2 price matinee of course and hiding the contraband drinks and snacks in his manbag) and upon arriving home, I noticed something VERY alarming in his arms. My husband came home with a complete fish tank/kit thingy.?! I don't recall having discussed adding additional live dependents to our home lately. As he set the thing up, I stood there, arms crossed and wide eyed, wondering where this thing was going to go (and more importantly, WHY). He assured me it would be clear and sparkling just like our pool and that it should go in the KITCHEN. I gave up. Threw in the towel. I Knew I was outnumbered as even Julia jumped on board and began naming the fish as soon as she saw them. Not only that, but we’ve returned to the pet store about 20 times to get new fish (they obviously despised their new home and decided it was better to be dead than live in such foulness). After umpteen hours, I've got the thing looking good again but.....why must I? I actually think this damn thing is taking up more time than maintaining the pool. I just can’t figure out how to ‘make it disappear’. I've had a fish tank in my kitchen for years! They are nice but do require cleaning about once a week. Your best bet on long living fish are the 10 cent Gold fish they usually refer to as "feeder fish". I have had them live up to 4 years!! But I do have a green thumb when it comes to fish... mine also grow to be 10 inches long :-) CLEAN YOUR TANK GIRL!! Having said that, I did clean the damn tank and am a bit bitter about it. Oh, and btw, we somehow killed the Gold fish (and several others) so we now have some type of 'hardier' fish. Party Pooper!!! Fish tanks are proven to have a calming and soothing effect on those who have them in their presence. (Maybe that was Christian's goal?) Although, I do agree that since it wasn't your idea, it shouldn't really be your job to clean it. Sounds like "puppy" syndrome. They're all cute and fun until someone has to actually feed them and clean up their poo. 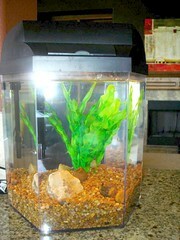 I'm curious as to how long it took to get your tank looking as vile as it does in your picture. Knowing how you like things clean and neat, I can see how that would gross you out. Bottom line, do the kids enjoy it? How about putting up a photo with it looking all sparkly clean with pretty fishies in it. I want to see the comparison. "Anonymous" oh, you! I know who you are for Pete's sake! I DO like pretty tanks I see, say in malls etc. with colorful fish. THAT I do love but had a funny feeling ours wouldn't quite be like that......and I was right. It took about 2 weeks to get the tank like that, BUT I spent hours getting it back to pristine. However, I don't want to do it again! I think the kids have learned a tad bit too much about death lately. They stopped naming all the new fish. Stop the madness. Run, don't walk, and donate it to your kid's classroom the 1st day of school - or sooner!! Gold-fish (even hardier versions)just eat & poop: the bigger they get, the more they eat AND the more they poop. Trust me, I've been there. Donation! THAT is a perfect idea! My hubby is all about philanthropy - that just might work. My ex-husband had a fish tank. My ex-husband cleaned the fish tank. It was one of those 50 gallon suckers containing giant Oscars who ate goldfish for dinner. I enjoyed the fish. I had nothing to do with the tank. Tell your husband he cleans HIS tank or it goes. The kids will forgive you. Hmmmm.... he just 'cleaned' it. It's not clean. His clean is not my clean. It's still gross. It's GOT to go...now, the strategy.